Looks like they will open Monday the 18th for lunch. Larry Levine of Chilis fame is the man behind this venture. Claim is authentic Central Texas BBQ. I like the look of the pits they use. 1050 N. Central Expwy. Richardson, TX. By the looks of things they appear to be doing it right. Then again so does the DFW Hard 8. I heard good things about the research he did for the menu. I can't wait to try it. Ten 50 BBQ is under construction in Richardson, just north of Dallas. You may have seen the sign along the Hwy. 75 service road north of Arapaho (at 1050 N. Central Expressway) and adjacent to the Arapaho DART station. Construction is underway for the major renovations to the existing building on site, and Ten 50 will open sometime this summer. Larry Lavine, who founded Chili’s back in 1975, is the man behind Ten 50. It’s been almost forty years since Larry Lavine opened the first Chili’s in Dallas. Back then it was just a burger joint that served chili and margaritas. The baby back ribs would come much later after Lavine had sold off his share of the company. He continued to develop restaurants in the Dallas area, and a couple years ago he emailed me. I’d never met the man, but when he suggested we meet at Mac’s BBQ in Dallas, I knew he had good taste. We talked barbecue in general, but nothing specific. I didn’t know then that Mac’s owner Billy McDonald helped develop the original french fry recipe for Chili’s when Lavine and his team couldn’t get it right. My brother and I went to Ten50 for lunch today. We had high hopes, but we both left disappointed. 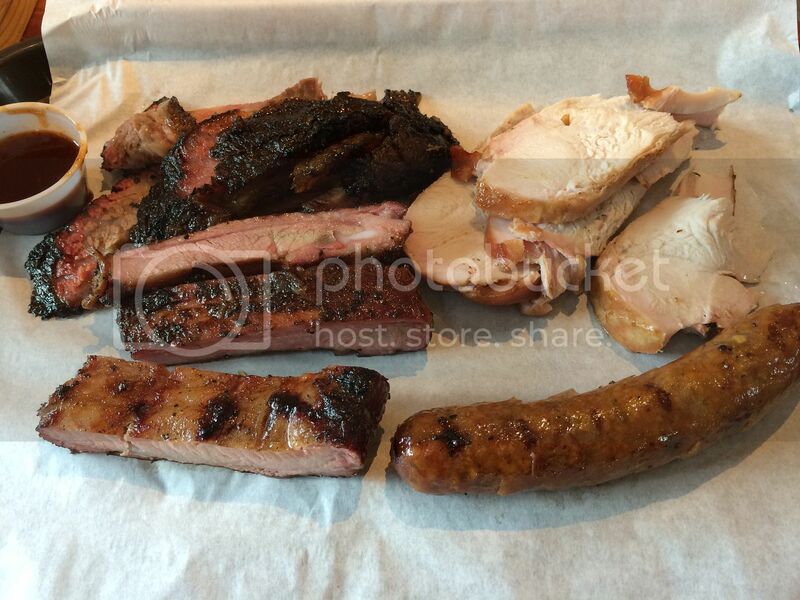 I ordered the fatty brisket, turkey, St. Louis style ribs, and jalapeño cheddar sausage. Brisket was okay and had a nice smoke ring, but it really didn't have much of a smoky flavor. Turkey was extremely bland and didn't have even a hint of smoke. Ribs were tender, but didn't have much in the flavor department. The lone bright spot in the meat department was the jalapeño cheddar sausage. It was a course grind sausage and was extremely flavorful. The corn and fries were excellent, but I don't think good sausage and good sides will make me want to make a return visit. First time any one here posted anything on 1050, it seems to be a 1 time visit type of place. Hopefully they can work out the issues and become what they dreamed of. Man, that turkey looks like they didn't even put a rub on it. Definitely gotta have some pepper crust on the outside of my bird. I agree w/ cowboydon. I'll give it a shot just to be fair but I'm expecting one & done. Have not been there and probably won't either. Reviews against vs for are running bout 3 to 1. No smoke and bland flavor with high prices is the jest of the reviews. Once the one time visit folks have made their visit, we shall see if the place survives. hard to put that kind of finish out cost and make bbq work as a business unless you have Franklin quality bbq. Just MHO. Just diificult to keep customers coming with high prices to pay for that building with average Q! Again IMHO. The jalapeño cheddar sausage is actually from Tyler - and you are correct about the mild it is Meyer’s Elgin Sausage. When a Chili's owner said he matched Franklin, I was pretty much out...lol. I have eaten at 1050 four times in the last 8 months. I have had the brisket 3 times (point & flat) and 2 times it was great, one time it tasted very good but a little dry. Twice I had a beef rib, whoever is in charge of that cooker knows what they are doing. Succulent. Spare ribs, meh. Very seldom do I find a spare rib out in the wild that I love. Didn't have any other meats. Fries very good, cooked to order. Corn on the cob very good, baked potatoes very good. Other side dishes pretty much in line with all other BBQ joints. I will eat here again.